Discover what ABSA and other organizations are doing to improve safety. In this issue of The SafetyNET magazine you will find profiles of our newest network partners whose expertise lies in the fields of first aid, electrical safety, transportation, orientation training, and more. This issue also presents valuable tips for keeping workers safe by sharing fire extinguisher maintenance guidelines (p.32) and providing a checklist of essential items to be included in every company vehicle emergency road kit (p.8). 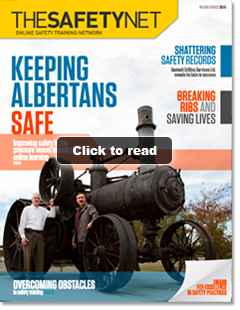 Additionally you’ll find features on companies that are achieving great success in safety. Pajak Engineering Ltd. (p.16) is looking to set a new standard in its industry through online safety training while Geotech Drilling Services Ltd. (p.12) is setting new safety records through behaviour-based training. Through eLearning, ABSA (p.18) will be connecting to local and international clients to ensure the safety of Albertans through the safe design, maintenance, and operation of boilers throughout the province.